HEXANE is the first release from Wooley, Haker-Flaten & Corsano together as Icepick and will be released on ASTRAL SPIRITS in September 2014. Although they all have extensive reputations worldwide as individual musicians…their work together as a unit shows an amazing subtlety and telepathy as if they were a well seasoned unit. Hopefully we’ll be hearing much more from them as a group in the future. A muscular player whose tone and attack run the gamut from Paul Chambers to Buschi Niebergall, his sense of both openness and control serves ensembles as diverse as The Thing, Free Fall, Atomic, Scorch Trio and the Kornstad/Håker Flaten Duo. In addition to his own Chicago Sextet and Austin-centric Young Mothers, Flaten has also recorded and performed with Frode Gjerstad, Dave Rempis, Bobby Bradford, the AALY Trio, Ken Vandermark, Stephen Gauci, Tony Malaby, Daniel Levin, Dennis Gonzalez and numerous others. Flaten studied at the Conservatory in Trondheim (1992-1995), turning professional shortly afterward, yet his hunger to play in new situations with new musicians – schooled or amateur, frequently recorded or just starting out – puts him in a rare class, that of a truly broad-minded artist. That mettle has served him well, living and developing the music under his own steam and drawing from influences as diverse as Derek Bailey, George Russell, Chris McGregor, filmmakers Ingmar Bergman, contemporary pop melody and gritty punk music as well as everyday sights and sounds. First spellbound by freely improvised music in the mid-1990s after witnessing performances by TEST, William Parker, Cecil Taylor, and others, Chris Corsano began a long-standing, high-energy partnership with Paul Flaherty in 1998. A move from western Massachusetts to the UK in 2005 led Corsano to develop an expanded solo music of his own, incorporating sax reeds, violin strings and bows, pot lids, and other everyday household items into his drum kit. In February 2006 he released his first solo recording, The Young Cricketer, and toured extensively throughout Europe, USA, and Japan. He spent 2007 and ’08 as the drummer on Björk’s Volta world tour, all the while weaving in shows and recordings on his days off with the likes of Evan Parker, Virginia Genta, and C. Spencer Yeh. 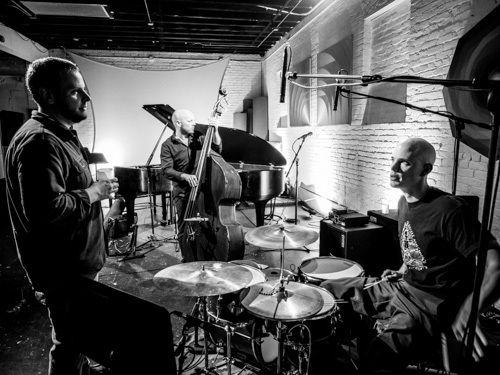 Moving back to the U.S. in 2009, Corsano returned focus to his own projects, most notably a duo with Michael Flower, Rangda (with Sir Richard Bishop and Ben Chasny) and solo work, now revamped to include synthesizers and contact microphones in addition to his drum set and home-made acoustic instruments. In addition to the those mentioned above, he’s also worked with, among others: John Edwards, Jim O’Rourke & Akira Sakata, Paul Dunmall, Nels Cline, Jessica Rylan, Jandek, Sunburned Hand Of Man, MV&EE, Vampire Belt, Joe McPhee, and Wally Shoup.